Aleigha Barrera is executive director of a nonprofit with big plans, but she’s not your typical CEO. It’s more likely you’ll find her wearing sneakers and workout clothes than a business suit. Barrera (B.A. ’97), who earned degrees in Sociology, and Exercise and Sport Science from St. Mary’s University, has two longtime passions: helping others and physical fitness. 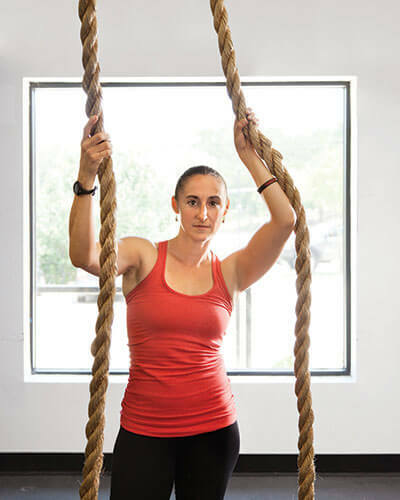 Since becoming executive director of a nonprofit benefiting wounded warriors through group exercise, her passions have merged. Last spring, Barrera joined Transition Possible, a young organization that positively impacts wounded service members and others with physical challenges or disabilities by helping them find community and achievement through exercise. San Antonio resident Rick Martinez, a former Army nurse who felt called to help wounded warriors after leaving the military, started Transition Possible in 2011. He first opened gyms specializing in CrossFit — a popular type of group exercise — where wounded warriors and other adaptive athletes could work out alongside regular athletes. The basis for Transition Possible fully formed, Martinez needed a full-time leader for the effort. He turned to Barrera, a regular and coach at his gym. “Most of today’s wounded warriors are in their early 20s, and they may have had a very different idea of what their lives after a deployment were going to be like,” she said. Transition Possible helps the public understand how it can help, how important it is to simply say thanks to a wounded warrior, and how to help them find community. 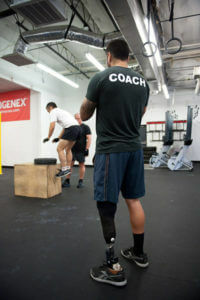 It is also a resource clearinghouse, providing information and advice on how to adapt to exercise for wounded warriors. “It’s about the awareness and understanding that there are just a few more things that you need to do to make it really inclusive,” Barrera said. Transition Possible wants wounded warriors to find a solid social support network, and also a solid career. “They have their whole lives ahead of them. Many of them were planning for military careers, and that changes when they come back from deployment with this kind of injury,” Barrera said. She is planning to develop an entrepreneurial boot camp that will help give clients the tools and resources to find a career path. “You see a lot of good programs that do special camping weekends or other activities for wounded warriors, and those are great. But what happens on Monday? They are young people, and many don’t have job training that they can use after the military,” Barrera said. The organization’s mantra is “Bowed Not Broken,” and wounded warrior Mike Gallardo is a great example of that. Gallardo started CrossFit a year ago and now coaches classes. He lost a leg during an Iraq deployment in 2007 and wears a prosthetic, but it hasn’t slowed him down. Gallardo struggles with the effects of Traumatic Brain Injury (TBI) and PTSD, making it hard to remember names or cope with social interaction. But CrossFit is a social experience in a safe environment, and it has helped. Now, while he works as a coach, he’s also going to college and plans to open his own gym one day — exactly the kind of result Transition Possible is looking to promote. While Barrera knows the wounded warriors get so much from the supportive environment of a group exercise class, so do the “able-bodied.” Working out next to Gallardo and other wounded warriors, it’s almost impossible to let yourself quit, she said.